Co founder, Business Partner and Managing Director. 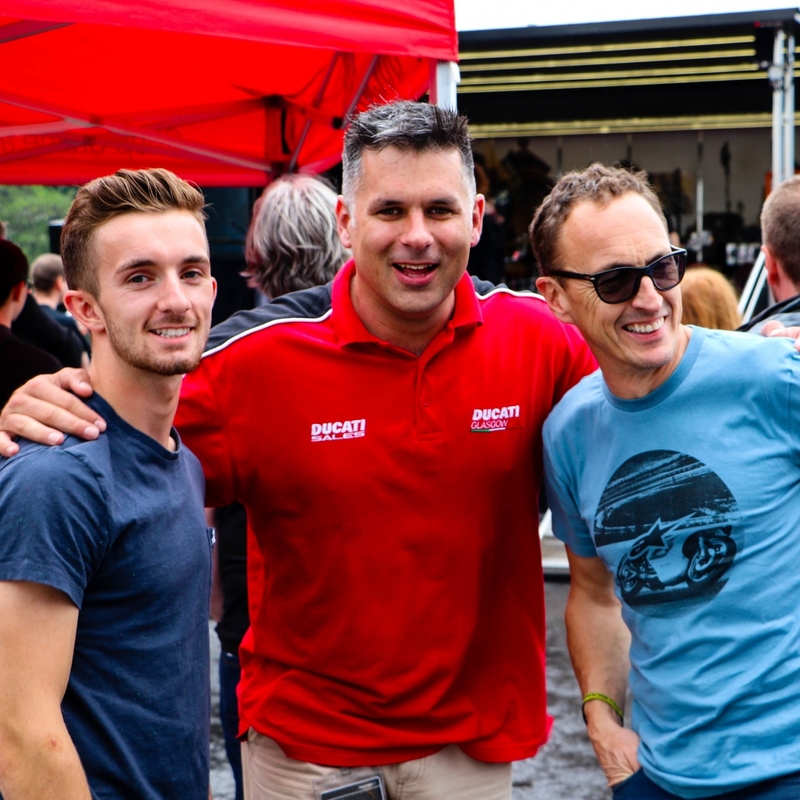 The absolute driving force behind the success of Ducati Glasgow. Another bike nut since a very tender age. Manager of the store whom sells the occasional bike! Business Partner. New to our business in 2015 but a welcome addition to the team. Firstly customer, now close friend to our team. 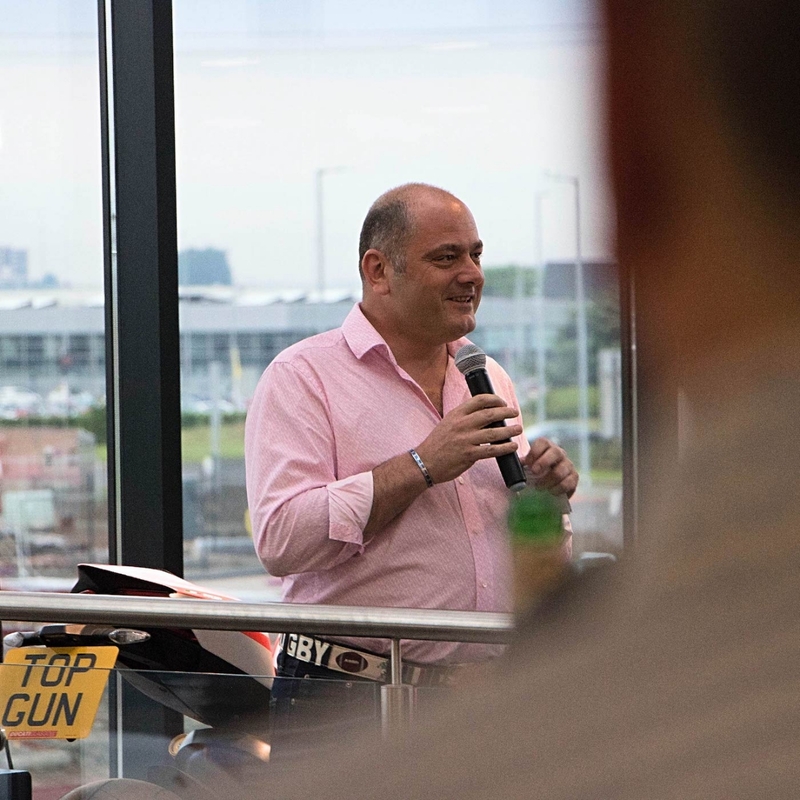 Mike brings over 25 years of experience from the financial sector and over 30 years experience as a biker to add to the talents of the team. Co-founder and Business Partner. Bike fan with years of business experience. Speciality is accounts and all things spreadsheet associated! (Martin's Mum) aka 'Mama Ducati'. Now a true legend in the Ducati community. The whole reason that the store is kept so immaculately clean for our customers. Also the reason the fabulous home cooking is available and our customers are always made to feel right at home - a true gem. Commercial Manager. Deals with much of the events, customer relations and retail finance. Pretty much deals with everything. 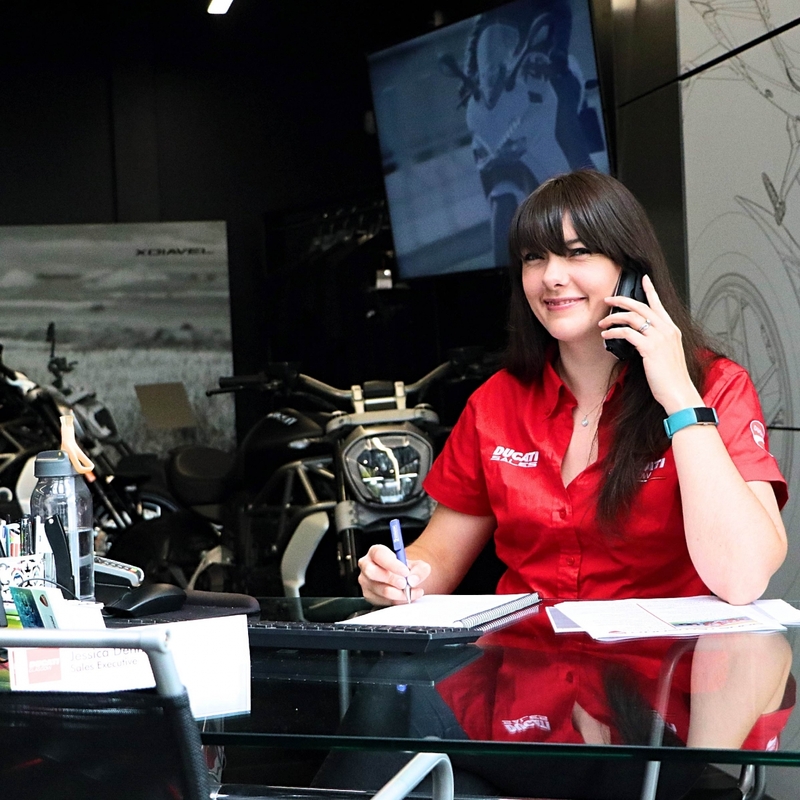 Highly trained in Business Management and a champion of customer care, Kerrie has held her motorcycle licence for a number of years. Financial Controller. We welcomed Marco into the leading role of the Finance Team at the beginning of 2018. 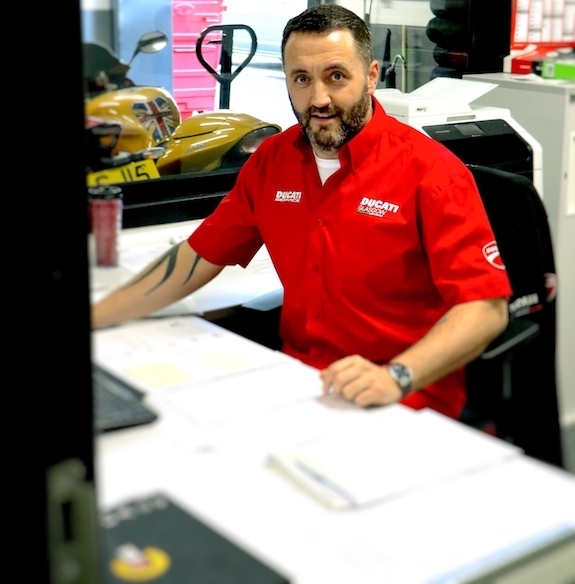 As a qualified Chartered Accountant (ACCA), Marco not only brings together the accounts, but also brings to Ducati Glasgow true Italian heritage. Originally from Rome, this native Italian gentleman also has his full motorcycle licence and rides to work nearly every day. Finance and Accounts Assistant. With years of experience in Booking Keeping, Accounts and Administration no task is too small for Heather. 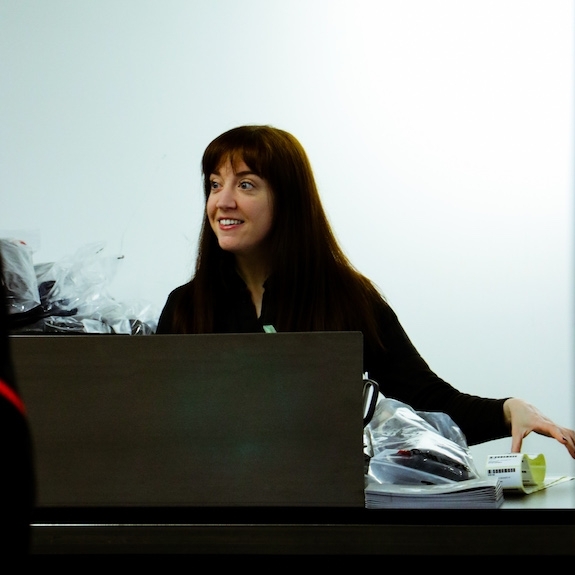 Providing support and assistance with a friendly smile, Heather is a strong, key member of our Head Office Team. Marketing Executive. Brought onboard to help plan and develop our marketing, events and communication with both our customers and clients. Has extensive branding and promotional knowledge and comes from a family of passionate motorcyclists. Ducati Sales Executive. 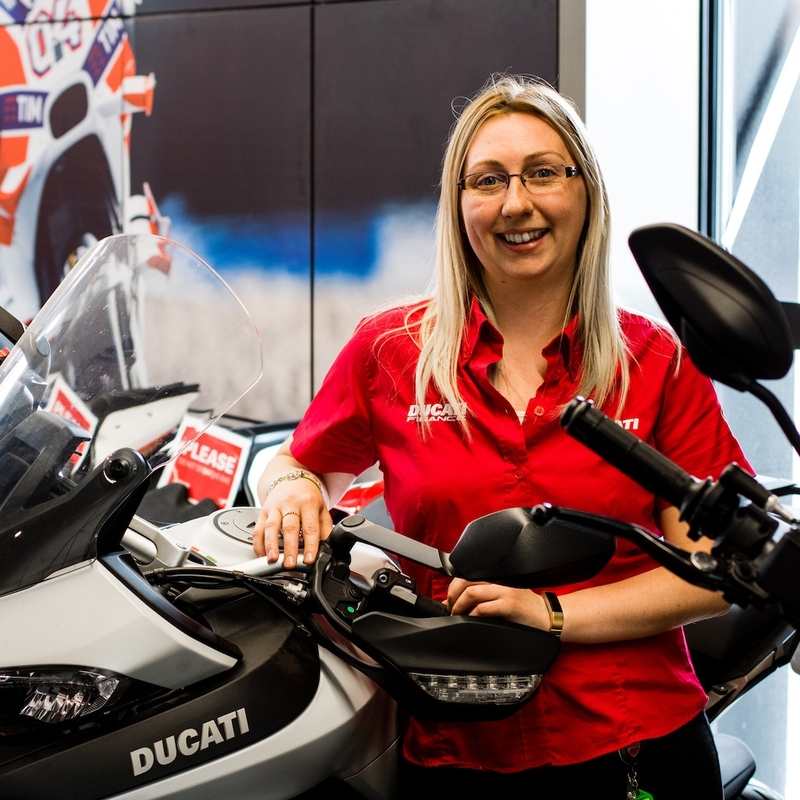 One of the most qualified, highly knowledgeable and experienced females currently working in the Motorcycle Sales Industry in Scotland. 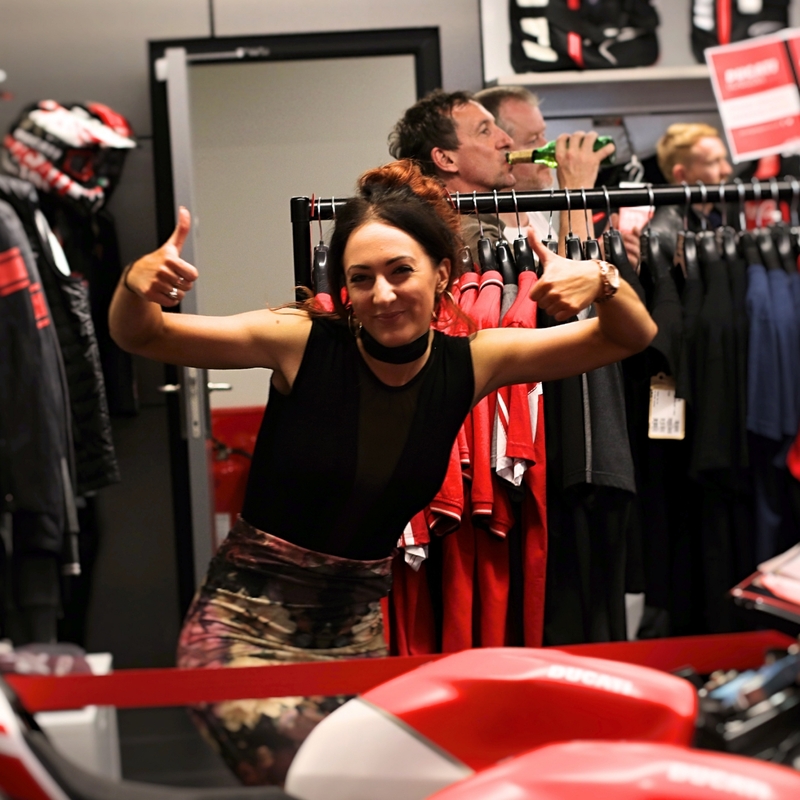 Jessica test rides all of our motorcycles in her own time to ensure she has a wealth of knowledge to help advise you with your choice of bike and any requirements or questions you may have. Ducati Sales Executive. 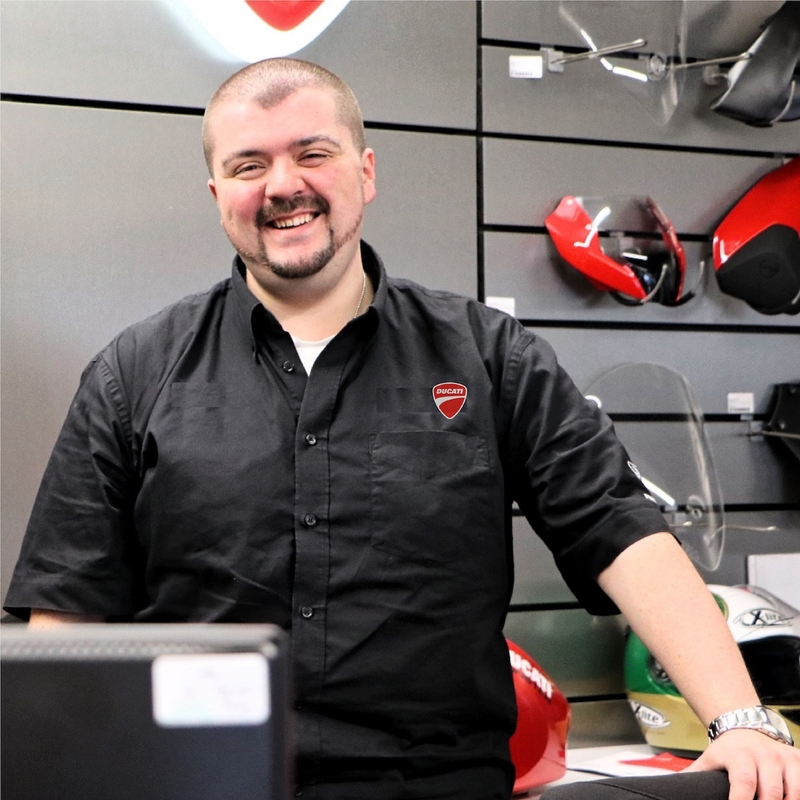 With over 20 years in the motorcycle trade, we can guarantee that Stewart will be able to answer your question honestly and with experience. 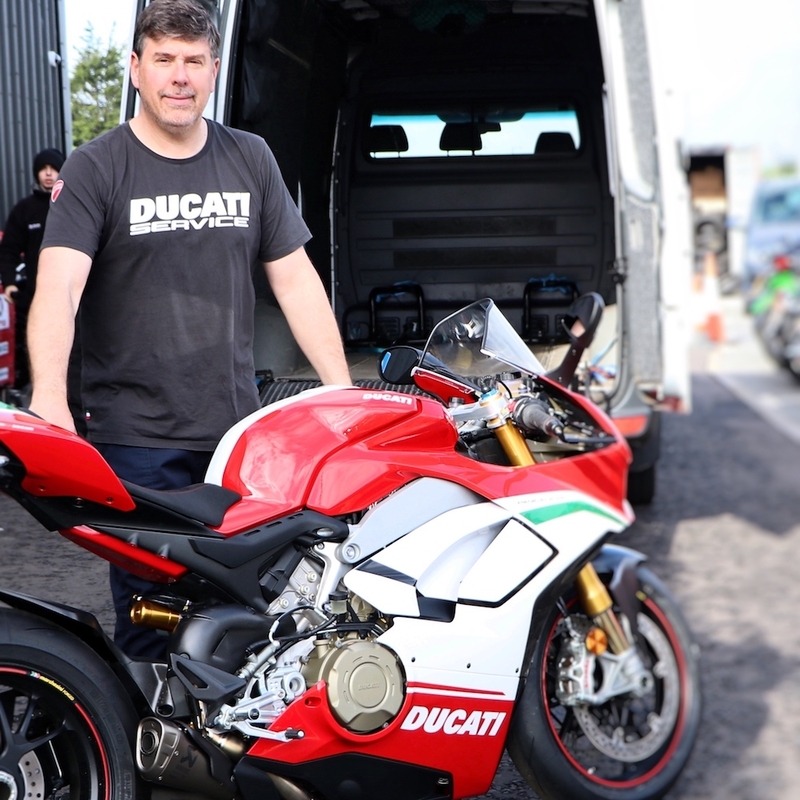 Stewart has toured most of Europe on various Ducati models over the years, and his passion within the Sales Industry is to find the right bike for you. For all kinds of advice, you can rely on Stewart. Brand Clothing Manager. Well known in the motorcycle world around Glasgow and has had many years experience in the bike trade. Has also held her licence for a number of years. Christine previously managed retail suites on cruise ships which toured the world! 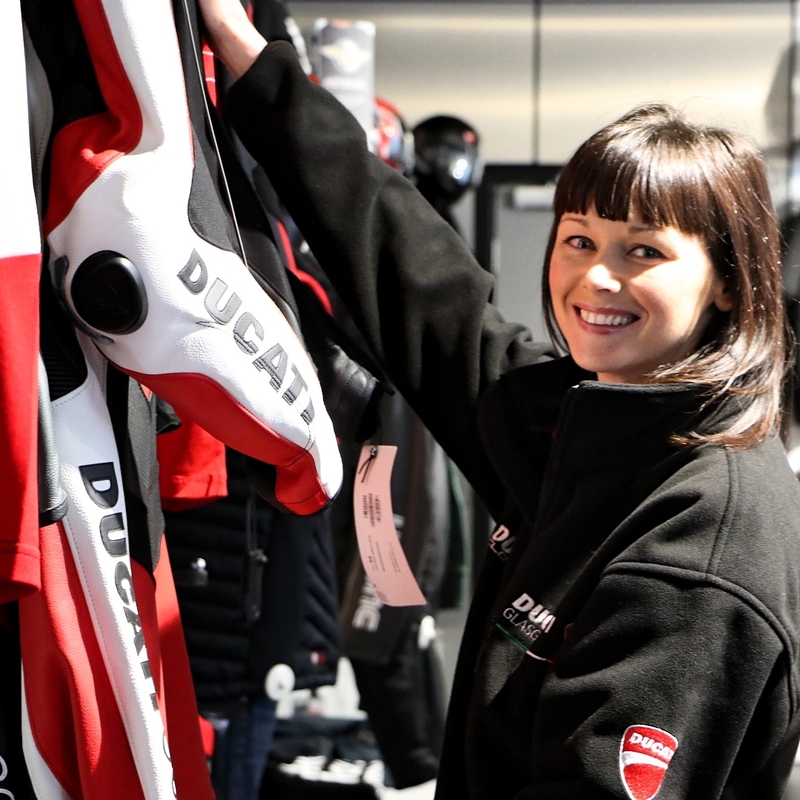 With a professional attitude, impeccable customer service skills and experience within luxury exchange rooted within the travel and retail industry, Christine couldn’t be more suited to the role of our Ducati Clothing Advisor! Christine also has her full motorcycle license. Ducati After Sales Manager. 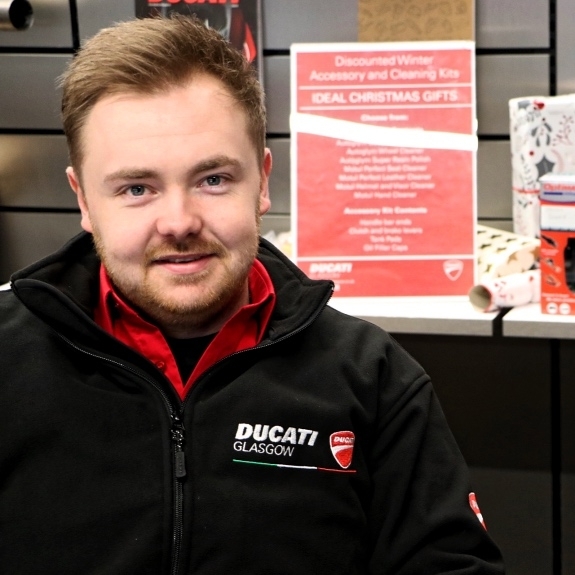 Our newest member to the Ducati Glasgow Team, highly experienced in the Commercial and After Sales Market, William brings years of knowledge and high level of customer care to our Ducati Glasgow Service Department. Also a very enthusiastic biker - a welcomed staff member. Parts Manager. Scott has worked in the motor industry for many years and has more than enough knowledge to be able to assist you with any parts queries or advice you may require. After a year with us as a Parts Advisor, Scott was promoted to Parts Manager due to his hard work and quality of service. Ducati Parts Advisor. 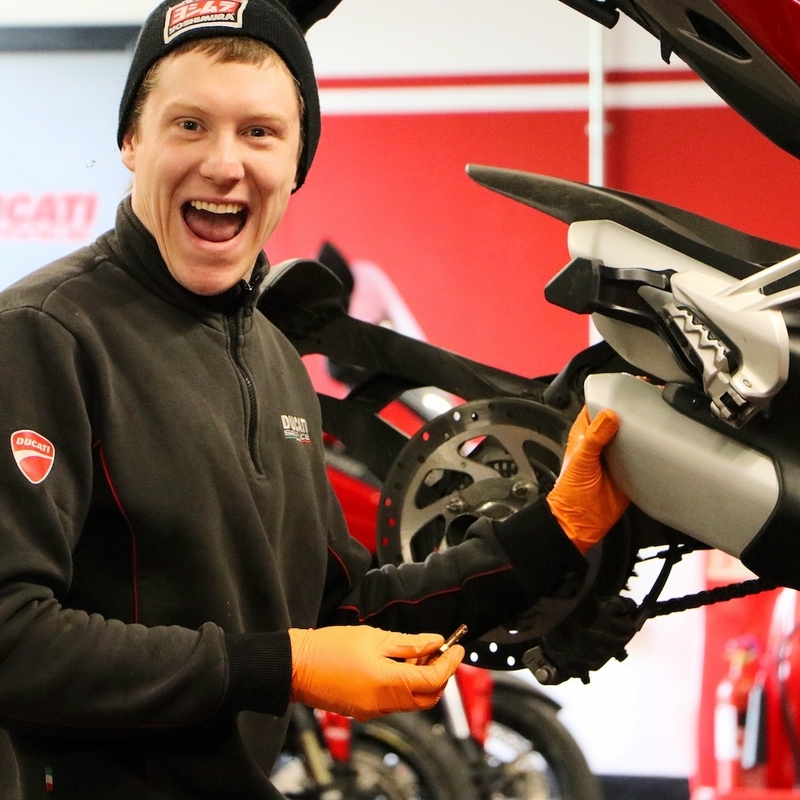 A well known personality in the motorcycle trade in Glasgow, Iain has been welcomed into the Ducati Glasgow Team to assist and support our Parts Department. 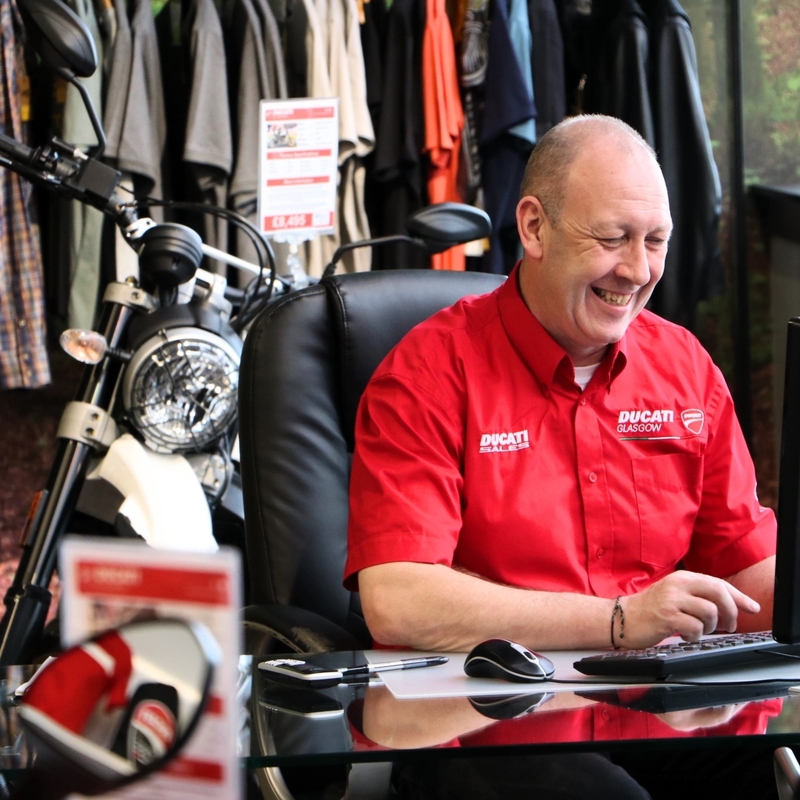 A calm and collected individual, Iain can advise, recommend, source and order any parts or accessories you require, for almost any bike. If you have any questions, Iain will be more than happy to assist. Ducati Service Advisor. 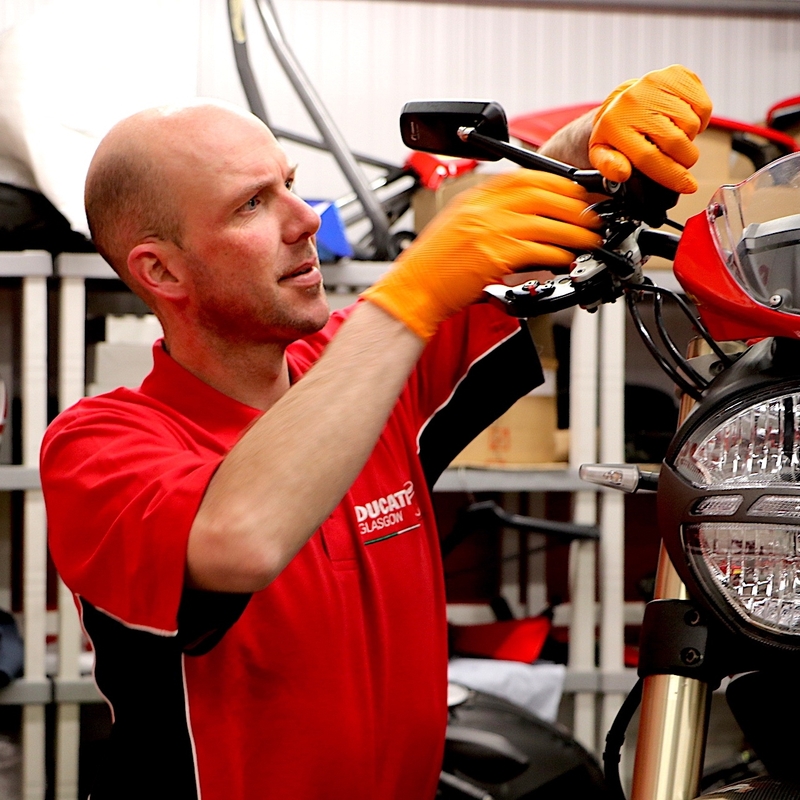 Although not yet a fully-fledged biker, Colin has worked in the prestigious side of the motor industry for over 12 years including working with Audi and Mercedes in Scotland, therefore his understanding of technical and mechanical maintenance is well above par. Colin’s other mad passion is for football and he has spent over 14 years travelling all over the world to see his favourite club play. You can ask Colin for a service quote as well as match score predications! Senior Technician. James is a welcome member of the team having joined us in September 2016. He has strong diagnostic skills and experience in fabrication within the motor industry. James is also a keen biker with a background in restoration having completed a number of bike restorations including a 1963 BSA Bantam and a number of Cafe Racer style jobs as well. Ducati Technician. 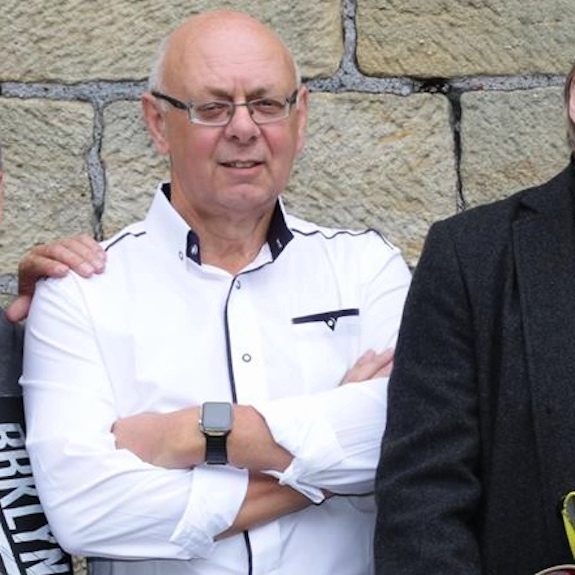 From a family of influential motorcyclists, Robbie has been brought up with bikes from a very young age, therefore his knowledge and experience is outstanding. An Ayrshire lad who has a fantastic work ethic and one of the cleanest work benches in our workshop. Occasionally puts a shift in our Cafe! Ducati Technician. With years of multi-manufacturer experience Jim brings a high level of quality to his hard work. 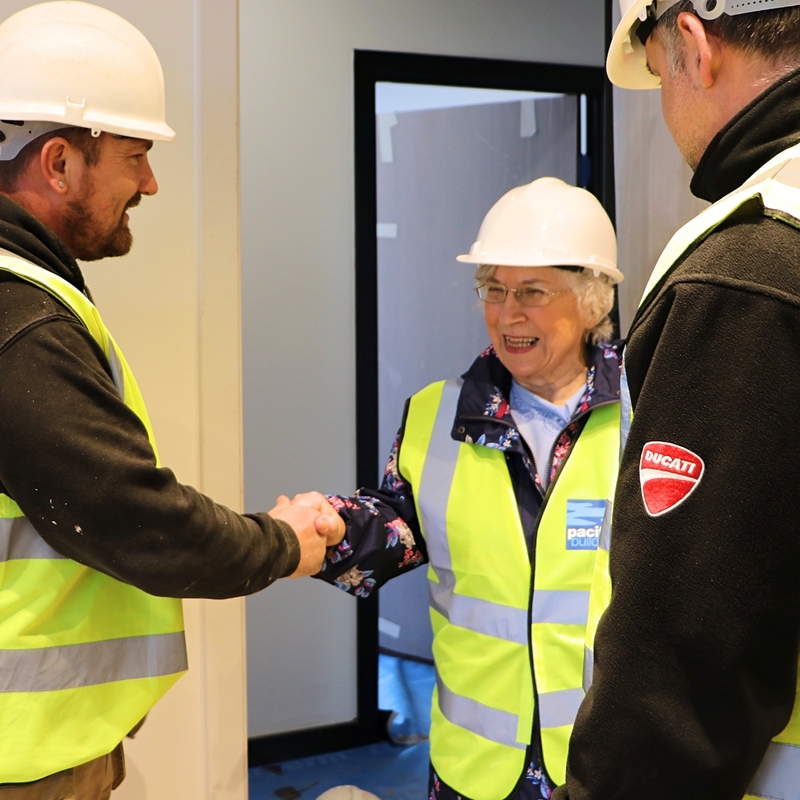 A very methodical worker, Jim finds the most efficient procedure for every task, making sure all work is completed to the highest standard. Always evaluating and looking to improve, Jim has a solid groundwork of technical knowledge and is a man of high-end quality. 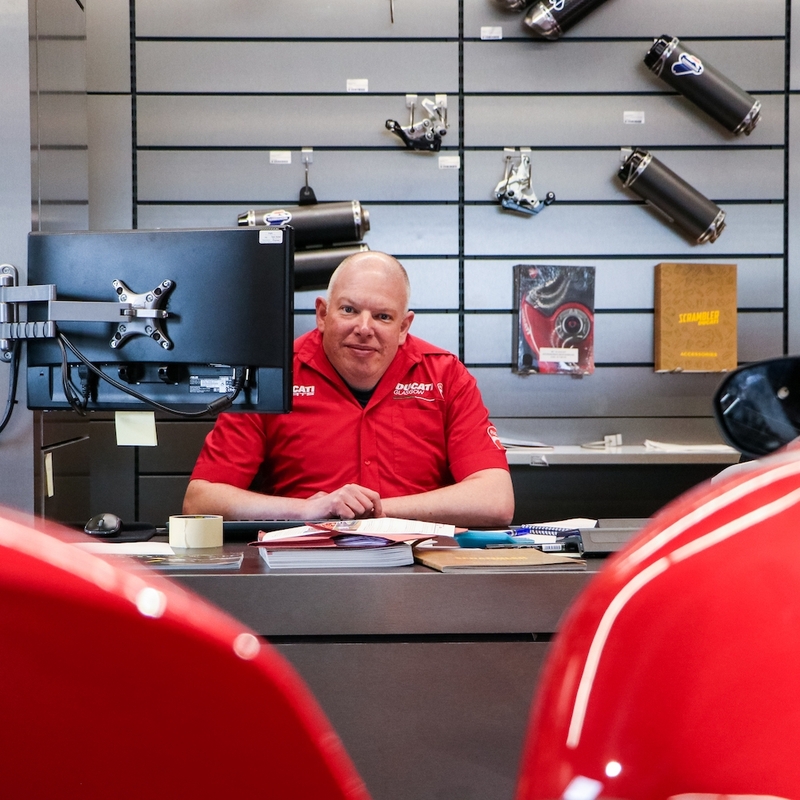 John has been in the motorcycle service industry for over 20 years and therefore brings a wealth of technical experience to our Workshop Department. 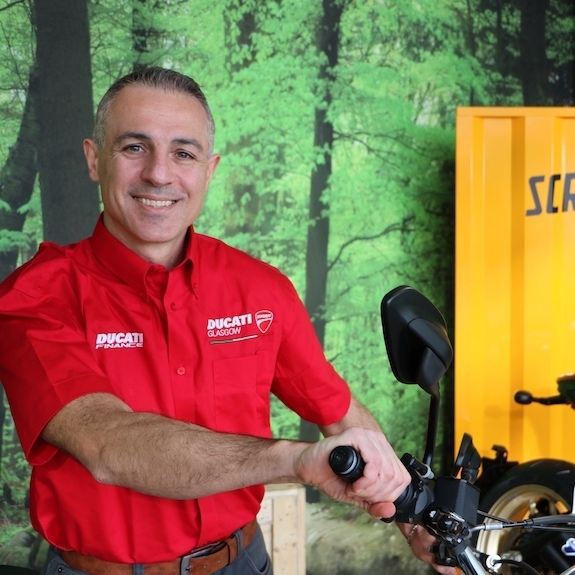 John’s extremely high skill set sees him specialising in the maintenance and repairs of our Multistrada and Scrambler range, while continuing to increase his expertise across our entire model range. John is also our fully qualified and proficient MOT Inspector. Dealer Support. Chris is our experienced Collection and Delivery Driver. 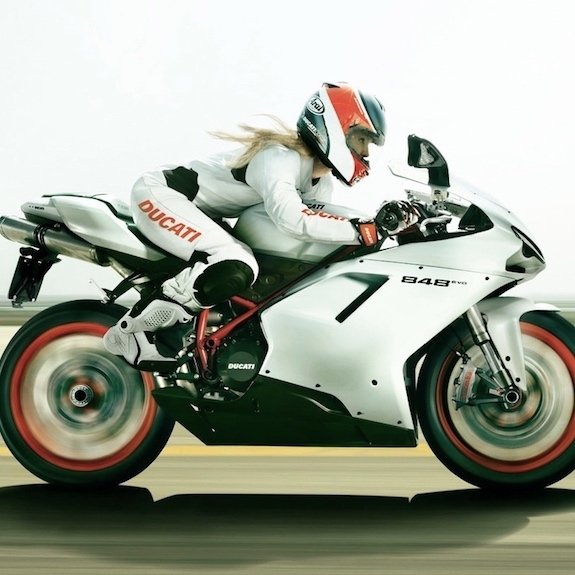 Trained in all aspects of motorcycle manual handling, securing all makes and models of motorcycles for transit and a true professional at loading and unloading your motorcycle at your home, office and our workshop. Chris is a gentleman you can trust with your bike so, rest assured your bike is in safe hands with Chris and our Dealer Support Vehicle. In-House Detailer. Gren’s attention to detail is second to none. 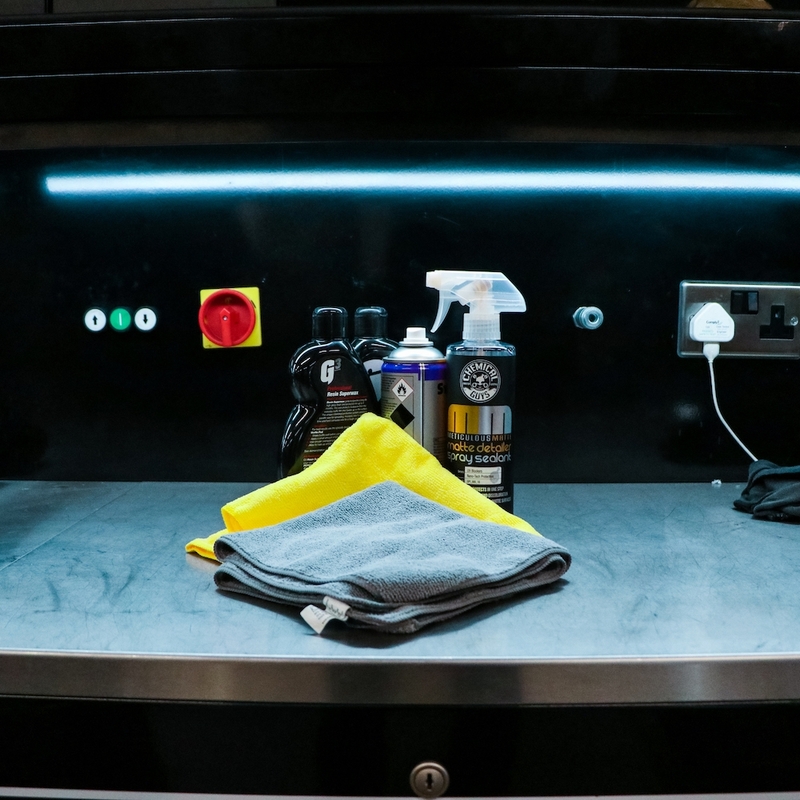 Brought on-board full time due to the customer demand, Gren works on washing, polishing, manoeuvring and meticulously detailing every motorcycle that comes through our doors including every test ride and every trade in so they are ready for our showroom. Cafe Operator. 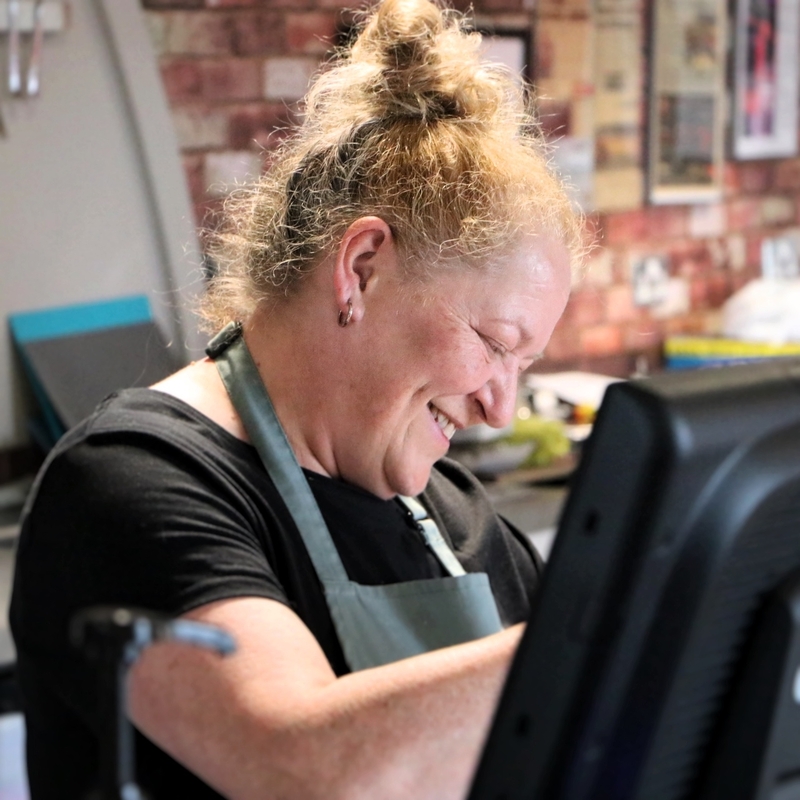 Esther has vast experience within the café industry and currently practices as a Chef in various locations around Glasgow and beyond. We have welcomed Esther on board, along with her ideas, creative plans, additions to the Cafe and every changing, delicious menus! Pop in for a coffee, homemade soup, fresh rolls and hot baked potatoes!